Instructions: Card size: 6 x 6" Card base is 12 x 6 "white folded in half. Cut the large tag, Decorative Pocket Accents and Ornate Pocket Accents out of white. Stamp Congratulations using Deep Purple and die cut with the Tickets and Tags long eyelet die (shortening to fit sentiment). Cut inside of large tag out of purple decorative paper (Lush Lilac) and cut the small round tag background out of orange Butterfly paper, the outside/Best Wishes part out of purple card stock. 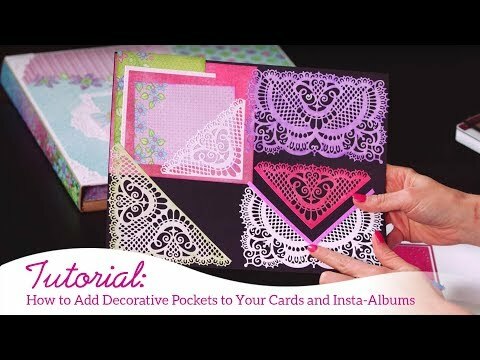 Glue large tag pieces together and Best Wishes tag pieces together, insert ribbons and set aside to finish card base. Cut a piece of the orange butterfly paper to 5 7/8 x 5 7/8" and glue to 6 x 6" folded card (white border is very small). Cut a piece of the purple Lush Lilac paper to 5 3/4 x 5 3/4" but do not glue it yet. Glue the decorative white dies to it and cut the pocket slit before gluing the panel to the card, make sure to keep pocket area open for tag to go into. Glue the sentiment to bottom of card and set aside while working on decorating the tag. Stamp Poppies using Tiger Lily, 2 layers per flower including small closed poppy. Sponge lightly with Tiger Lily and die cut then sponge edges again to darken. Stamp Lilacs with Deep Purple and sponge with Majestic Violet. 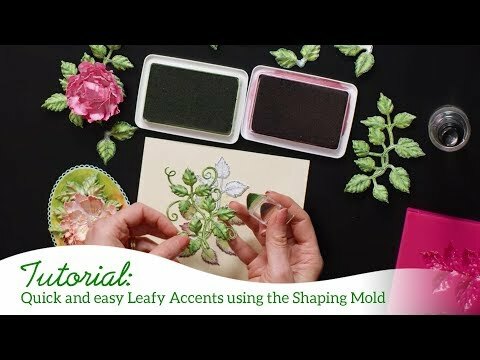 Stamp Leaves with Library Green and sponge with Leaf Green then die cut. 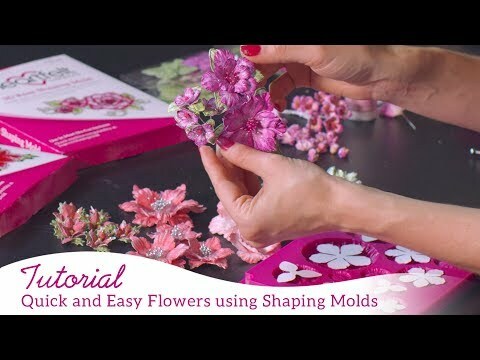 Run flowers through machine with the Floral Basics Shaping Mold, the Lilacs with the Lilac Shaping Mold and the Leaves in the Leafy Accents Shaping Mold after misting each layer and let them dry completely before moving on. Punch poppies in the centers to bring petals up and glue them together, 2 layers each. Add glue to the centers and sprinkle in the Black Gala Glitz (California Poppies have black centers and seeds). Slightly press lilacs in the centers and add glue then sprinkle with orange Prills. Cut leaves apart to use as needed. Sprinkle glitter to tag background before beginning arrangement and then start with the largest flower toward the top (use strong glue as glitter is hard to stick to). Arrange Poppies and fill in with leaves and Lilac then add glue here and there and add more orange Prills. Insert tag into the pocket of card and you're finished!